NDAs: Protect Yourself from "That Guy" - Kennedy Law, P.C. The purpose of a non-disclosure agreement, or NDA, is to ensure that your business ideas, many of which cannot be protected by copyright, trademark, or patent law, remain secret so that you can disclose them to potential investors, vendors, prospective employees, and even employees after you have hired them (although that last one is tricky depending on what state you live in). Your NDA should have a paragraph stating that disclosure constitutes irreparable harm to you and your company and that the recipient of the confidential information is responsible for payment of your attorneys’ fees and damages if it is broken. The NDA should further secure venue and choice of law in the venue in which you reside or in which your company is located for any disputes. The subject matter of the NDA could include your latest idea for a business, your idea for a domain name, your recipe for the best-ever chocolate chip cookie, and even your method for obtaining new customers. If you believe you have a new idea that is marketable, there are very few people you can trust with that information. The law in Texas would allow the man in the coffee shop to take the idea he overheard and use it as his own. Whether the man acted ethically is a question for legal philosophers. My point here is that the people at the coffee shop were reckless with their business idea. They knew where they were. They knew that others could hear them. They know that people use laptops and smart phones. After you sign an NDA, you should still be cautious about how you communicate your idea. If it is through email, make sure you are using email that is encrypted on both ends, like Protonmail. If you are in a public place, go somewhere quiet where you cannot be overheard. When I was a new associate at a huge law firm, I was taught to never discuss business in an elevator (which is still advice I follow and hand-out to whomever will listen). The gentleman above who decided to register someone else’s domain name was not a party to an NDA so an NDA would not have helped. We live in a competitive world; if you are speaking loudly in a coffee shop about your secret idea, this is what happens. In the “for what it is worth” department, the man who took the domain name is not totally in the clear. 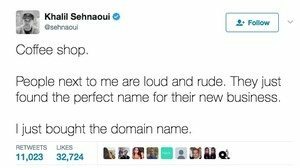 He could be required to turn-over the domain name under certain circumstances using ICANN’s dispute procedures, but the point of this blog is to keep you out of those situations. My advice: use an NDA, talk quietly, never discuss confidential information where a third party who is not privy to the information is present, and always be aware that there are people out there who will take your idea without a moment’s hesitation. An NDA can help you protect your ideas.